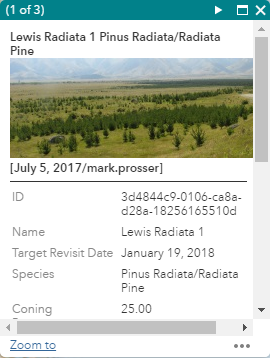 The Explorer Application is used to view the wilding conifer data that has been input via the Data Maintenance and Mobile Applications. Users can access the application through the online portal. This section describes the main elements of the user interface. The toolbar displays the functionality available in the Explorer Application. The toolbar displays six icons which can be clicked on to bring up the panel for that particular function. The icons are: Legend, Layer List, Print, Select, Measurement, Basemap Gallery. 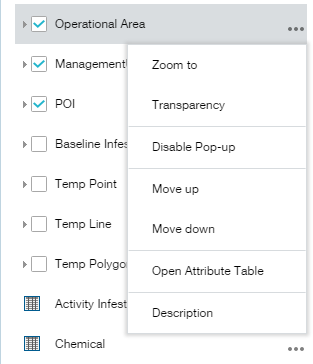 Clicking on a feature in the spatial view will open a pop up screen which displays the attributes for underlying features. The user can click on the arrow button to move to the next feature (where multiple features were overlapping the point on the map that was selected). The user can turn the pop up screen to a full screen view by clicking on the maximise button next in the top right corner. If a photo has been attached to the feature the user can view this by scrolling down and clicking on the link at the bottom of the pop up screen. The zoom tools on the map, allow you to zoom in and out. In addition, if you are using a mouse, then the mouse wheel allows you to zoom in and out. It is possible in the application to control the order and visibility of the layers in the map and choose which basemap to show. The Layers Panel can be used to control the order of layers within the map, to change their transparency and to view a legend. The panel is launched by clicking the layers icon on the main toolbar. To adjust a layer’s appearance the user clicks on the dotted lines icon to the right of a layer. A pop up menu will appear. The layer order sets the hierarchy for how layers display on the spatial viewer. 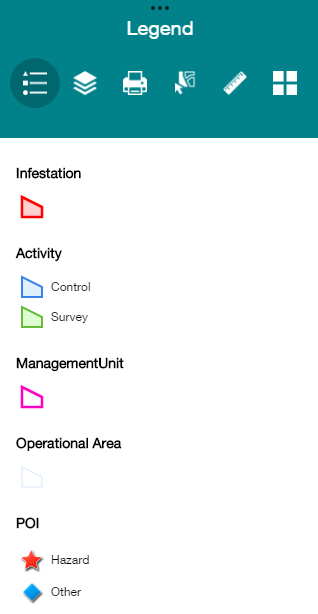 Any layer listed above the layer of interest will appear on top of the layer on the spatial viewer. 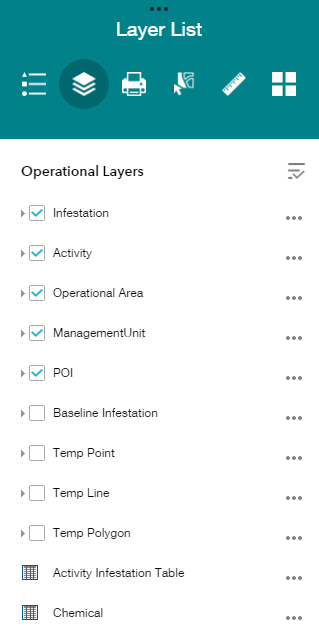 Any layer listed below the layer of interest will appear underneath the layer on the spatial viewer. The transparency of a layer determines how visible it is on the spatial viewer. The user can adjust the transparency of a layer by clicking on the transparency option on the layer pop up menu and adjusting the slider between Opaque and Transparent. Note: setting the layer all the way to Transparent will make the layer invisible on the spatial viewer. The base maps panel, makes it possible to change the base map that is being shown in the map. This is useful if the map is cluttered and a simpler base map is required. 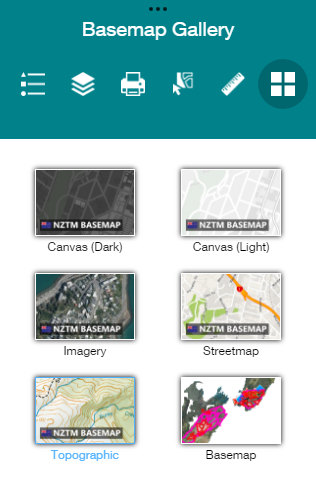 The user changes the basemap by clicking on the basemap icon on the main toolbar and selecting a basemap from the list. Select the Print icon on the main toolbar to access the Print screen. Learn about the programmes and partnerships we've put in place to stop the spread of wilding conifers. 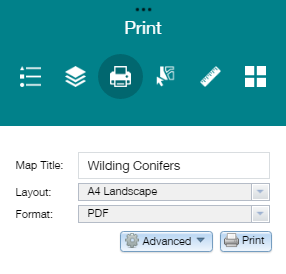 Access the Wilding Conifer Information System.